The mission of 20Ways is to educate pharmacy managers on products and services that serve to improve patient care or to improve a pharmacy's financial bottom-line. This relevant information is presented through twenty unique product profiles. 20Ways is published on a quarterly basis, and subscriptions are free for those in pharmacy management. 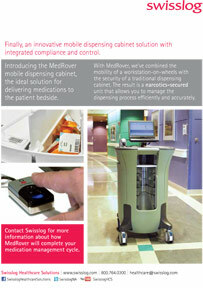 MedRover is the innovative medication dispensing solution providing a closed loop bedside medication delivery system with the capacity to store patient medications, floor stock, supplies and the security to store narcotics. 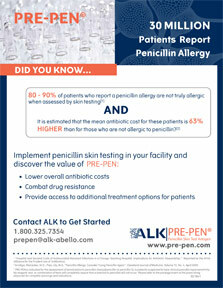 Implementing penicillin skin testing throughout a medical facility can help support stewardship programs, lower overall antibiotic costs, and provide affordable treatment options for patients. Ensure patient safety by testing your cleanroom's air quality with the industry-leading SAS Super 100 and 180 air samplers. 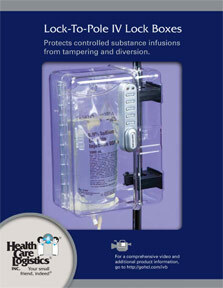 Safety-conscious design details on HCL's exclusive Lock-to-Pole IV Lock Box protect infusions from tampering, prevent theft and improve patient safety. 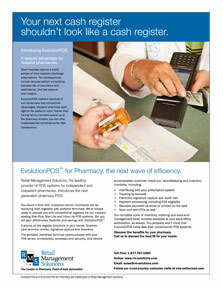 In a constantly changing environment, central pharmacies are required to adapt quickly to complex problems. They must meet the medication needs across their entire health system. AutoPharm Enterprise helps manage these difficult challenges. 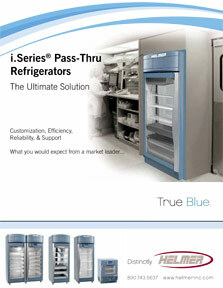 i.Series® Refrigerators provide the ultimate solution for cold storage providing customization, efficiency, reliability, and support. 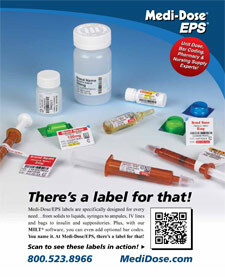 MILT® 3.0 Label Software by Medi-Dose, Inc. / EPS, Inc.
MILT 3.0 software will improve patient safety and decrease medication errors with barcoding and formatting flexibility. 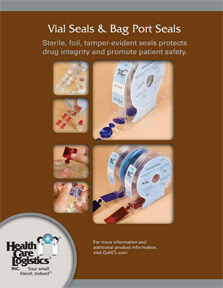 Tamper-evident Vial Seals and Bag Port Seals from Health Care Logistics protect drug integrity and patient safety by leaving a preprinted "OPENED" warning that appears when the outer layer is removed. 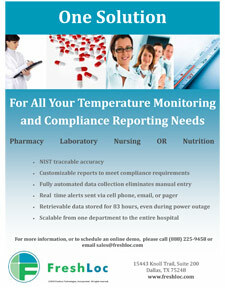 FreshLoc, a pioneer in temperature monitoring in healthcare, provides 24/7 monitoring, alerting and reporting. FreshLoc enhances patient care, eliminates tedious manual logs, reduces losses and automates compliance reporting and is web based. RemoteSolutions provides safe, efficient, off-site medication order verification and processing services which meet The Joint Commission standards, HIPAA regulations, and applicable state licensing requirements. 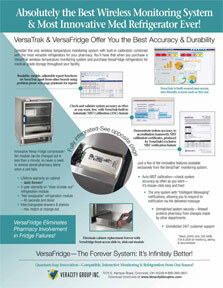 VersaTrak and VersaFridge provide pharmacies with accuracy and security in wireless monitoring and the best warranty and most flexibility in medical refrigerators. 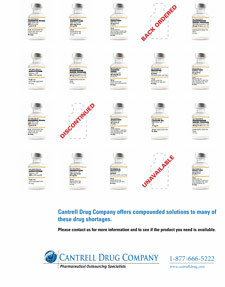 Cantrell Drug Company can prepare many of the sterile drugs currently on backorder or discontinued by the manufacturer - saving you time, costly alternatives, and potential medication errors. EvolutionPOS is the next-generation, portable point-of-sale system. 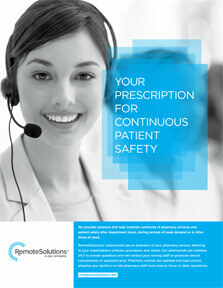 It enables hospital pharmacies to capture more discharge prescriptions, by delivering right to the bedside. 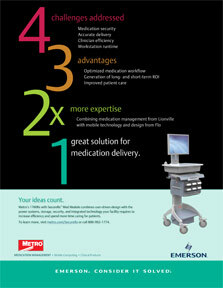 Metro's 1760Rx Hybrid Mobile Workstation Easy, secure medication management at the POC. Metro offers pharmacy fixtures, medication carts, mobile computing workstations and automated dispensing cabinets designed to support pharmacists, nurses and technology professionals throughout every step of the distribution process. Improve patient care by providing free, unbiased, and objective reviews of current evidence based research geared towards clinicians and consumers. 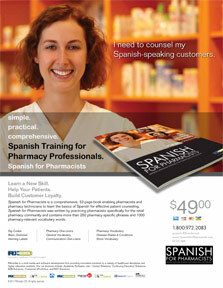 Developing Spanish counseling skills will help increase patient compliance and build customer loyalty within your outpatient pharmacy. 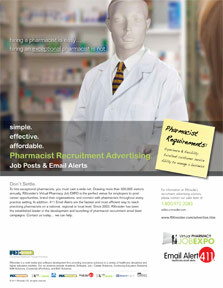 When you need to hire a pharmacist, RXinsider's suite of recruitment advertising products saves money by maximizing advertisement dollars and by growing your qualified candidate pool. 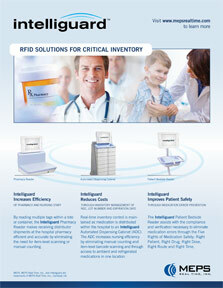 Intelliguard™ RFID Solutions for Critical Inventory by MEPS Real-Time, Inc. Subscribe to join 30,000 pharmacy decision-makers who receive the print/hard copy version of the 20Ways (free for pharmacy management). On the go? Download the 20Ways mobile app onto your tablet or smartphone for convenient mobile access, anywhere, anytime. Review the 20Ways video portfolio to access dozens of 60-second video overviews on every product and service displayed in the publication. Load the most recent 20Ways onto your desktop, tablet, or smartphone for quick and easy electronic access. Sign up for RXinsider's 411 Email Alerts to receive continuous email announcements on products displayed in 20Ways. Join RXinsider's social media network to receive continuous announcements and postings on products displayed in 20Ways. "I enjoy receiving and reading the 20Ways publication. 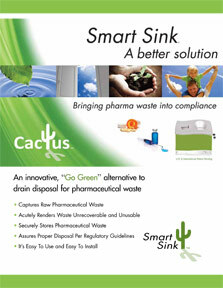 I often tear out and save product profiles that may be of use to our pharmacy. Keep it coming!" "20Ways and Platinum Pages are an easy way to keep abreast of unique ideas to improve revenue streams. 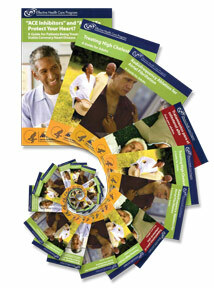 I look forward to receiving the publications and ensure all of my pharmacies get a copy as well!" "20 Ways readers are the perfect audience for our forward thinking solutions. 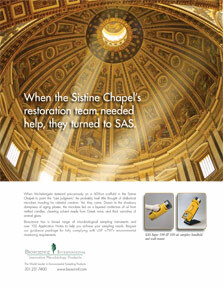 We receive increased interest after each time we're featured." "With market pressure from managed care, independent pharmacies need to find new and unique ways to generate additional revenue streams. I find the 20Ways the perfect resource to turn to. It is relevant, timely and exceptionally well done." "The 20Ways is useful and practical. It contains some great ideas and I not only look forward to receiving it, but retain a copy of every issue." "I receive the 20Ways and Pharmacy Platinum Pages books and find them very useful when I need to source companies and services." "I have been receiving 20Ways since the first issue and find it relevant and useful. I have followed upon many products that have been profiled." "We receive tons of junk mail and marketing propaganda, but the 20Ways is different. I love the unique products and ideas presented in the structured format the 20Ways offers. I look forward to receiving it and would suggest it be published more frequently." "We have several of the products that you have featured in the 20Ways Winter Hospital issue and this looks like a great avenue to find new and cutting edge products!" "I find the 20Ways publication informative, relevant and to-the-pointâ€¦ just what a busy pharmacy owner needs. Our pharmacy is following up on four of the Ways profile in the fall issue." "I look forward to reading each edition of the 20Ways - both online and in print. It's a unique and relevant publication for the pharmacy marketplace." "I read the 20Ways Spring edition and was very impressed with the publication. Many of the ideas presented I will put into use in the practice of pharmacy in our family business. We are a 10 store independent chain in Western Pennsylvania." "The 20Ways was a very informative and enjoyable read. I found it very useful and not a lot of hoopla within the pages. I found it very precise and to the point." "Clean Harbors participates in every 20Ways hospital issue because the ROI justification is very transparent. 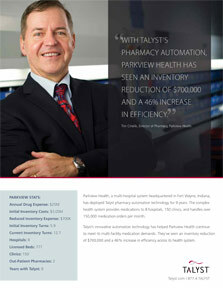 We've converted several opportunities that originated with pharmacy hospital directors reading about us in 20Ways." "20Ways delivers great value for me as an independent owner because the products profiled are relevant and informative. I use the 20Ways retail issue to help me make decisions on new products to purchase." "I love the 20Ways publication. I see such value in the information presented, I save every past issue as a reference." "20Ways is great, especially for the latest technology! We serve the long term care industry and depend on 20Ways to keep us up-to-date. Whenever I am looking for a new and innovative service or product I turn to this publication"
"I use 20Ways to conduct research on Rx30 at the recommendation of Cardinal Health as we consider a new management system." 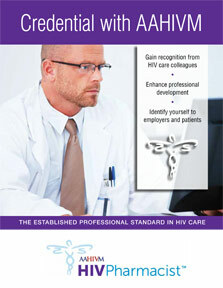 "I look forward to receiving to the Pharmacy Platinum Pages and 20Ways publications every year. Keeping up on emerging technologies and services in the pharmacy market is important to me, and RXinsider's publications help me do just that." Why Advertise in the 20Ways? Every Way Profile and Display Ad Comes with a Custom 1-Minute Video.